The course will provide you with a fun experience on making and will give you an overview of the world of casting materials and its use for architectural models, covering different techniques and materials such as silicone moulds, alginate, plasterboard, concrete and resin.Both beginner with little experience and those with professional ambitions are welcome to participate. 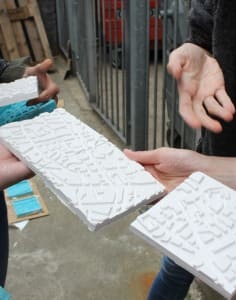 The course is taught across a series of short exercises combining theory and practice, solved through direct experimentation and manufacturing, and will include techniques such as carving, moulding, and casting. Participants will take with them all the work produced during the course and an instructional publication on the use of the materials together with a diploma will be provided upon completion of the course.